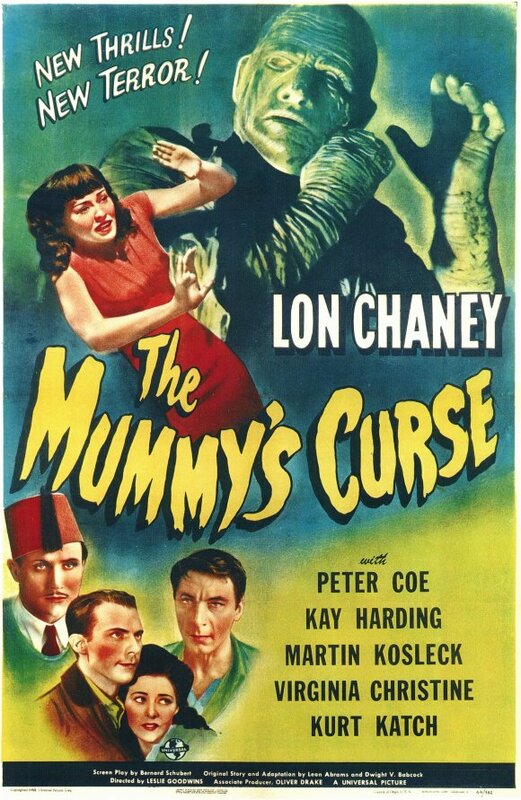 Tag line: "OUT OF A TRAP OF 1000 TERRORS, COMES PARALIZING HORROR"
Produced in 1944, The Mummy’s Curse is, in many respects, a lot like the other entries in Universal’s Mummy series, yet manages to distinguish itself by giving its main characters not one, but two ancient Egyptians to contend with. Set 25 years after The Mummy’s Ghost, The Mummy’s Curse takes us back to the same Louisiana swamp where Kharis (Lon Chaney Jr.) and his beloved Ananka disappeared. Dr. Halsey (Dennis Moore) works for the local museum, and is anxious to locate the remains of the two mummies before the swamp, which is being excavated by Pat Walsh (Addison Richards) and his construction crew, is completely drained. What Halsey doesn’t know is that his assistant, Dr. Illzor Zandaab (Peter Coe) is actually an Egyptian High Priest. With the help of some Tana leaves, Dr. Illzor raises both Kharis and Ananka from the dead. Ananka, who’s transformed into a beautiful young woman (Virginia Christine), has no memory of who she is. Rescued by both Dr. Halsey and Walsh’s niece, Betty (Kay Harding), Ananka is taken to Halsey’s campsite for safe keeping, causing Kharis, under the control of Dr. Illzor, to embark on a killing spree as he tries to reclaim his ancient Princess. With the addition of a living, breathing Ananka, The Mummy’s Curse brings an interesting twist to what otherwise would have been a humdrum motion picture (the shot of Ananka rising form the swamp is wonderfully executed by director Leslie Goodwins, and is easily the film’s best scene). Even the flashback sequence, which seems to come standard with every entry in the series, is well-handled. 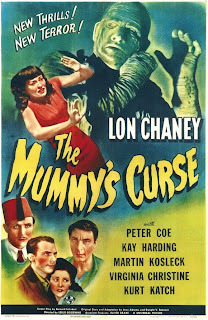 Several of the movie’s other aspects, such as the introduction of yet another High Priest and his attempts to control Kharis, fall a bit flat (which may have something to do with Peter Coe’s lackluster performance as Dr. Illzor), but the film’s strengths help it to overcome these more predictable elements of its story, making The Mummy’s Curse an engaging final chapter in the Mummy series.